I am still extremely enjoying life as a new father, although I am missing the ability to up and leave at the drop of a hat, but it is all worth it. I have been still kayaking a tonne starting to concentrate my time to creek boating more than anything these days. I am heading to Thailand with the family over the month of December, planning on breaking the little girl into travelling as young as possible. Life is still good in Edmonton, still working as the Outdoor Recreation Programmer at the Strathcona Wilderness Centre anxiously awaiting snow so I can put the sticks on and go for a rip. All in all life is great, a bit busier but great. Now that my son, River is in high school, I can focus on me again. . . so, when not fire fighting, I will continue my selfish summers of being on the river in the North and looking forward to a Haiti mission in early 2013 working in an emergency medical tent. This past year, I have been busy teaching at Lakefield College School as an Outdoor Education teacher and also managed to travel a little on my time off. In February, I traveled west for skiing and also got to meet up with some fellow NRA guides living in Canmore. In March, I was fortunate enough to be able to travel to Thailand on a service trip, volunteering at an elephant rescue park. Over the summer, I was a bridesmaid (see photo! ), guided students down the Wind River and also volunteered at a camp for kids with cancer. Looking back on the year, I realize how amazing it was. I can’t wait to see what 2013 has in store! After graduating from Engineering in 1990, Bruce continues to look for a job – rather unsuccessfully. To fill his days, he writes a weekly column in Globe and Mail Travel, and gets outside as often as possible, including a 10 day, 100 mile, father-and-son goat-packing trip in Utah this summer. I am still working in Edmonton busy tinkering and designing as a mechanical engineer and using as much of my vacation time as possible to get on the water. Unfortunately, I wasn’t able to do a trip up north this past summer, but I was able to sneak away from the office for a 9 day whitewater kayaking trip in BC. While the rivers we paddled didn’t have the beauty and serenity of their northern counterparts, they made up for it with km’s of fantastic whitewater! With the season over; I’m dreaming of fresh tracks and powder turns and maybe an expedition or two down the mighty Tat or the Nahanni next summer. Hello River people! We are on the “home stretch” of finishing our recycled off the grid cordwood masonry house in the forest. The final steps are taking place like planting out our living roof, and lime hemp plastering the interior walls using spices, minerals, and earth pigments for colour. With the solar panels amazing us with their power we have joined the present century and now have hot running water and electricity! Our yurt has now become the guest house and we get to enjoy the home we literally built one piece of firewood at a time by hand on weekends with the help of family and many many dear friends. Thanks to all. What a journey! We have had time this paddling season to explore new rivers in Quebec and Ontario. Tripping together in Spring and Summer and Sean had the chance to go on a longer white water trip with friends in Northern Quebec, while I returned North to Guide a trip on the Nahanni for the Canadian Tourism Commission. It felt so great to return to my other home! Stay warm this winter, we will with our 16 inch walls! This winter I’m once again teaching creative writing at UVic. And I just recently had a great time at the Victoria Writers’ Festival where I was on a panel called “The Wild and the Worldly.” I think it was that viral photo of me busting out of the tundra biffy armed with the shotgun and a flask of whisky that got me the gig. None of the philosophers on the panel had quite the same credentials. Except I wondered about Elizabeth May, our host–that women’s got some crazy energy and must have something incendiary powering her confrontation of the status quo in Ottawa. Kapow! Whether you’re a green supporter or not, I’d recommend getting on this woman’s email list if you want to stay on top of all the environmental protections (etc!) our government is currently trashing. It’s depressing, but there’s so much we can do to protect our one and only earth. I’ve also just completed a year-long counsellor training course and now am volunteering as a counsellor at an agency called Citizens’s Counselling. This is amazing one-on-one work and I love it. It’s so meaningful to just spend time talking with someone as they find their way through grief, loss, depression, abuse, whatever it might be. I’m always learning something about hope and healing. Next spring I’m looking forward to spending three months as the Writers’ Trust of Canada writer-in-residence. This means I’ll be living in Pierre Berton’s childhood home in Dawson City, Yukon from April to June and working on the manuscript for a new book. Can’t wait for the long light! My wife Katie and I welcomed our new baby girl, Lucy Miriam Kyte, to the world on June 15th, 2012. The adventures of parenting have kept us busy this summer and we are enjoying life as new parents. We bought a house in Kingston, ON a year ago where I am working as a teacher. Looking forward to some outdoor adventures next summer with the little one. I am coaching cross country skiing at the Augustana Campus of the University of Alberta in Camrose, Alberta. As per usual, I missed being up North this summer and felt the nostalgia stronger this spring than I have in the past. I spent summer back in Golden working 7 days a week, rafting on the kicking horse and working at the bike park. I spent my spare evenings riding XC around the Golden area. The summer was a much needed break from school to rejuvenate my soul. This September I’ve started my final year of nursing school, and will continue to struggle my way through the program until late July 2012. Not sure where nursing will take me but I’m hoping to return to the mountains, or return to the North! The Summer of 2012 is now behind us and for my family and I it has been great. This spring Julie and I purchased a small local rafting company, with two boats and one bus. Big Canyon Rafting runs rivers in the Quesnel area. This new venture did not, however, keep me from my annual pilgrimage to the rivers north of the 60th parallel. This year I guided one trip up North on the Tatshenshini river, a great trip from the time we put out boats in the water at Dalton Post, to the time our old friend Pat Pellet put us on the plane at Dry Bay. When I got back to BC, there was no time to rest, for fellow raft guide, Chris Rhodes’ bachelor party we put together a 6 day Babine river expedition, truly one of the most amazing trips of my life. Chris’s wedding on Quadra Island became the perfect excuse for a family road trip and we spent just over a week travelling around BC. Tyler Garnham and I spent a couple days out on his sailboat exploring the gulf islands, I think Big T had a bit of a chuckle seeing me out of my element as we sailed across the Strait of Georgia. At the end of the rafting season I found myself on another one of BC’s best rivers, the Chilko is an absolute gem in this province and when I did the math I was amazed to find that it had been 8 years since I had last been down that river. Our family is doing well, Logan will turn 2 in November and if all goes according to plan he will have a little brother or sister in February. The house we have been building is finally coming along, we’ll see what comes first, the baby or the house. With that being said, I have to go outside and swing a hammer. Enjoy the icy months and I’ll see you when the snow melts. PS, The Fall 2012 edition of British Columbia Magazine has a story on a Babine River trip we did in 2009, There are some great photos by Tyler Garnham in there. This is Blaze CJ finlayson who is now 4 m old and River TRA finlayson who is 3 years old now. We are still in Vermilion, and I’m still working at the college. We are awaiting winter so we can turn out paddles in for our skies and hit the mountains. I am living in Whitehorse after moving here last November. Finally living in the north! It’s as great as I thought it would be. I am working as a Registered Nurse on a casual basis, as it fits into my social/outdoor/music/travel schedule:) It was great to get back to guiding this year after taking last summer to finish school and spending some time for myself and my family. After guiding I did a few personal trips: a packraft trip on the upper Alsek, a wedding/visiting in the Okanagan, visiting my new and first nephew in Alberta, and Italy/Switzerland to visit my partner. This winter, I hope, will hold lots of skiing, music,shinny, and other general northern shenanigans. Congratulations to river guide Chris Ford, his wife Ali and son Ben for their new family addition: Kate Eliza! She arrived January 12th at 7 lbs 6 oz. Kaj is back home in Camrose for the fall getting in as much paddling as possible before the ice arrives. He is also eagerly awaiting the official invite from the RCMP to begin training at Depot in Regina, SK. Hello fellow paddlers, the leaves are nearly over here in southern Ontario, starting to think about the winter. Got to get my home, my sailboat, ready for the cold. Soon to be plastic bubble on the water in Hamilton Bay. I did manage to escape my bubble for a few fun trips last winter. Skied in France/Switzerland for the new year ( do not turn up at the airport without a passport, it can be very expensive!! ) Then I had amazing trip to Colombia, a friend’s wedding, so I tried my best at salsa in a kilt. I managed to squeeze in one trip up north this past summer, a return to the Burnside, and again it didn’t fail to provide some amazing close wildlife encounters. At the end of the summer the rugged east coast of Lake Superior was my home, sea-kayaked for 11 days, wow, that is one big lake, definitely an inland sea ! I’m still working full-time at Hamilton EMS, next year should be easier to fill with fun things as I’m going to job share. Just starting to plan a trip home to Scotland for Christmas/ Hogmanay and most of January, looking forward to it, rain, rain and then some more rain but there’s always a fine single malt to warm the inside. I think the Alsek beckons again for next summer. Hi folks! This fall brings new and challenging changes for me: I am working at the University of Alberta and Alberta Recreation and Parks Association, teaching and doing research. It is great to be in the classroom and working in the recreation field! Fall is in the air in Edmonton and I am looking forward to the winter months ahead when I can trade my paddle for cross country skis! Hello from Dry Bay! We’re still waiting for the weather to break! A brief recap of 2012, so far – Most of my time is still spent at Acadia University doing some grad work focused on water-based recreation, specifically kayaking, and the impacts of Independent Hydropower Production (aka IPPs) in BC with a specific focus on the Ashlu Creek near Squamish, BC. The work has been interesting and frustrating however has been a great experience thus far and I’m really enjoying the people and places of Atlantic Canada. I will be able to return to Vancouver Island over the holidays and look forward to spending time with friends and family. I’m sure the break will include a few chances for recreation including several river trips and a good amount of time up at Mt. Washington with hopes of a trip to Revelstoke, Silver Star and Sun Peaks to see other family and friends. I’m now in Wolfville, NS and the fall colours are stunning! Hope to see a few of you in 2013. Not sure what river I will be on as always I’m sure a Tatshenshini or two will be on the menu and I would be elated if I saw my name next to the Firth, Nahanni, Snake, Mountain, Burnside, Thelon, Soper, Alsek, Coppermine…and the list goes on. Happy River Dreams and I hope you’re doing well!! After an amazing summer of guiding on the Burnside and Soper Rivers, I took a little solo time and hiked the Akshayuk Pass on Baffin Island. It was spectacular! Afterwards I came back down to Alberta the long way (ie driving) and took the month of August visiting friends and family, attending weddings and all the usual summer/fall fun. I also took a brief side trip up to Whitehorse to visit friends and “guiding family” and, of course, to enjoy the splendor of the Yukon. I am currently in Canmore working at the hospital, and working (but mostly playing) at the Canmore Fire Department. In my off time, I am dreaming and scheming up other adventures which may include further winter trips to the North, trips to Eastern Canada to ski and hopefully even a trip to Norway. Although it will be hard to leave Canmore since we just got a big dump of snow and are already skiing. Yahooooo! After an incredible summer travelling in every northern territory- Alaska to Nunavut in one season, I am back at McMaster University working towards a second degree in Earth Sciences- Hydrology and Watershed Management. 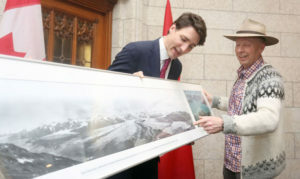 I am also involved in an exciting project to create the largest urban protected area in the world, centring on Cootes Paradise and the Niagara Escarpment..
My love affair with the North continues to grow stronger, ever since my can-can dancing days in Dawson City. I’m so grateful to have shared such an incredible time on the Tatshenshini with such amazing, inspiring people, and heaps of Dutch Oven-certified baked goods and fresh fish. At home in BC, I’ve been dedicating much of my time helping out at a local organic farm, leading a community hatha yoga practice, as well as organizing music festivals and tours. Been doing lots of travel. Cuba for a music trip, Italy by Ducati with music thrown in, Utah for family and hiking and Vancouver Island on my own Ducati. Lovely year so far. Heading to Mexico and Arizona next week. Looking to retire from the fire department and continue my career in Guiding next summer. I still love playing basketball. It is a joy for me to visit with the my guiding friends like Gribben and Collins. Hope that’s enough. If not check facebook. Last summer was speckled with extreme events; high floods on the Nahanni river and blazing hot beach parties on the Tatshenshini-Alsek rivers! This mixed up weather didn’t prevent lots of costuming and special moments in these majestic landscapes. As if the summer was not filled enough with glaciers, i have now migrated north to Sweden for one year studying Glaciology and Cold Climates. In between ski trips to Lappland and Norway, inspiring daily life in Scandinavia, i am still pursuing glacier monitoring projects in the Canadian Rockies, funded by the Royal Canadian Geographical Society. Also looking forward to a ski expedition in the Arctic this spring. Thinking of you guys from the summer will keep me warm through this journey into the cold! Stay cool. It’s hard to believe that another summer has come and gone already! This past summer, was again, filled with 6 weeks of northern adventures. We had the honour of guiding the Mooseponds canoe trip together this summer, a dream that began almost a decade ago after reading Joanne Moore’s journal, Nahanni Trailhead. The river treated us with warm sunny days and highwater around every corner. Exhilarating to say the least! Chloe then set off to guide on the Mountain River and Rob finished up his season on the scorching hot Nahanni. We were fortunate enough to be able to head back to Ontario for 4 weeks in August to relax at the cottage, visit family and guide a 5 day canoe trip in Algonquin Park for Chloe’s charity, Connected In Motion. In last August we headed back west and were able to make it too fellow guide, Chris Rhodes wedding out on the west coast. Fall and winter are shaping up to be action packed…let the snow fly! Rob is still busy teaching for Raven Rescueand Wilderness Medical Associates and Chloe is even busier running events for young adults with Type 1 Diabetes and speaking to audiences around the country about living an active, healthy lifestyle as a Type 1 Diabetic. See you up North next summer! Hope you have all had a fantastic summer and are planning your next great adventures. We still haven’t made it back up North yet, but have a feeling that will change next season. The two rugrats are growing like weeds and life is exciting and new everyday. We had two big camping adventures and Tessa has rafted three times before the age of two. Poor kids don’t have a chance! Royce will finish his last stint of school at BCIT this winter and will be a full fledged Red Seal carpenter. 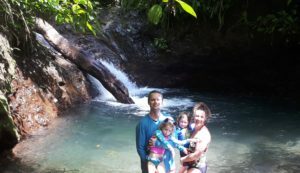 Trish has started a program in Recreation Therapy and will be working on that for the next while…..
Hello all you Adventure Seekers and River Wanderers! Here’s a little gossip from the world of Jeff Siddle to wet your whistle! In the past year I have had 3 kids, bought a camper Van then ran away with Less and Neil to join the Alaskan Circus as a Choreographer for the dancing Polar Bears!! !….Ok, you got me, I didn’t buy a van! Besides all that, It has been an amazing year full of challenge and change down in the Bow Valley. In the fall of 2010 I moved to Canmore to start work at a wilderness therapy company for youth with addictions. In my role as a Youth and Family Support Worker I support clients and their families in their difficult and heroic journey through treatment. In addition I have the privilege of taking the clients on therapeutically intentional wilderness experiences throughout Alberta. It is a powerful program full of struggle and reward that I feel honored to be a part of. Shortly after moving to Canmore I was joined by Mr. & Mrs. Rob and Chloe Vance!!! It has been such a treat exploring the Rockies with them and sharing many delicious meals together (often inspired by the Nahanni cook book!) We can often be found bouncing down the ski hills, marching up the mountains, or sharing a laugh by a camp fire, so if you are going to be around Canmore keep your eyes and ears open we might not be far away! I hope the year has been good to all of you and your families, and I look forward to seeing you all again up in in the beautiful Canadian North! All the best and happy travels! Had a great time on the Alsek this year with Whitey, Rhodes, Neil and a host of great people. Read the Blog post. At home, my oldest turned 4! and I dragged Tyler Dinsdale on a sailing trip to the Gulf Islands. BC magazine ran a great rafting article that I shot on the Babine river: Have a look. Looking forward to a great season next year and hope to get up north for at least 2 trips. My Yellowknife adventure is now entering its 6th year and I think it’s time to use the phrase ‘settling down’ to describe my current situation. Although I did not get the pleasure of guiding this summer it was definitely still an adventure. I lead a team of 8 road cyclists and 9 crew on a non-stop 3000 mile Race Across America. Funds raised went to benefit a northern youth food program run in many schools called Food First. I was honored to help this charity whom work tirelessly to get basic nutrition programs into every school in the NWT. My other small adventure was marrying the love of my life in Las Vegas on August 30th. Sarah and I got married at a drive-through wedding chapel and then drove off into the sunset. At least that was the plan anyway until the car stopped running right in the middle of the strip! I can’t wait to share many more moments like that with her as no matter what I seem to do she never stops smiling. I look forward to seeing you all again soon on another northern river so I can bore you with an endless wedding photo slideshow. Until then. I am still working at Augustana Faculty (now part of the University of Alberta) in Camrose teaching outdoor education and leadership. Our kids, Jasper and Kaisa, are now 9 and 6 and we are going on longer and longer bikes rides, ski trips, and hiking trips and on a recent canoe trip Jasper and Kaisa demanded that they paddle a canoe together; it was a surprising and proud moment as Jasper sterned the canoe in a straighter line than either Krystal or I have ever seen Neil pull off. In June I did a canoe trip with my class from the north end of Artillery Lake over Pike’s Portage and along the north shore of Great Slave Lake. There was more ice than water; we pulled our canoes over ice for 95 kms–it was a great adventure. After another great season on the Nahanni, I went to the Yukon for a fantastic Tatshenshini trip. In Whitehorse I spent September working in the warehouse, cleaning up from the season. Now I am building houses, working on my Carpentry apprenticeship. My girlfriend Paige is here in Whitehorse with me. We have great snow here so winter will involve lot’s of skiing. Following great trips on the Firth and Alsek, I went back to Smithers, BC to open my fishing lodge on the Bulkley River for the steelhead run. It was a great season and now I am deciding what adventures are awaiting for the winter! I just got back from 4 weeks in Nepal where my girlfriend and I went hiking for 18 days in the Himalayas. Great trip. This summer my time was spent at home in the Rockies where the fantastic weather of late July and August made for great climbing and running. I did not make it up to the northern rivers this summer, but next year I’ll be back. Sam arrived this summer! Thane, Sam and I are going to Mexico to introduce him to kite surfing this winter! After the outlandish good fortune of getting the privilege guide trips down the Firth, Alsek and Tatshenshini rivers this summer – no doubt some of the most amazing rivers on Earth – I rendezvoused with Tyler, Tyler and 12 of my closest friends in Quesnel. We piled into Ty D’s Prison Bus and commenced a super-stag down the Babine river. The trip was relentless fun and Tyler Dinsdale organized the entire thing with considerable aplomb. I made it back to Quadra Island six days before my wedding where Sarika and I married on a beach at her cabin in front of 150 lovely family and friends. Everything was perfect, beyond perfect really. I can say without a shred of hyperbole that it was the greatest day I have yet to be a part of. We’ve been honeymooning ever since and have a trip planned to Mo’orea in January. Fall and winter bring more application and grant writing misery and hopefully a trip to Patagonia to run the Futaleufu. The past few seasons have found me sunburnt and scouting the rapids of the Colorado River in Grand Canyon, dreaming about icebergs and the cool northern air! In winter, I am available for powder laps out of Nelson, BC where I work as a ski patroller. Otherwise, I’m just another girl with a truck and a dog!! Jamie Burdon – after one of the most amazing summers sharing the Mountain River with an amazing group of people, visiting past guests in Ontario, and shooting a wedding in Barbados, I have have taken the plunge and entered the Mont Tremblant Ironman next August. Why, you ask? Curiosity. Nadine Burdon – We had an amazing summer! Since then, I have been splitting my time between outdoor education work at the Strathcona Wilderness Centre and a backlog of images from our trips and wedding photography! Looking forward to the ski season. Trish and I have had a great year starting out the year trekking in Nepal and Bhutan for six weeks. Then spent the winter ski patrolling and doing finish carpentry. Unfortunately, I did not get a chance to guide a trip this summer for the first time in over thirty years but as a consolation did a great private canoe trip on the spectacular Wind River. I finished the summer with lots of hiking and a slalom canoe race where I finished first overall, placing in the top three of solo, men’s and mixed tandem. Looking forward to getting back up north next summer. I am currently guiding with HeLa Ventures in Rocky Mountain House, AB, www.helaventures.com, until the end of October. Sometimes we get snow storms but it keeps us well versed in the art of preventing and treating hypothermia. I am planning on going back to Patagonia for 2 months to explore that awesome wilderness some more and fulfilling a promise I made to myself 7 years ago to go back. The rest of the time I plan on relaxing, skiing and doing whatever I feel like at the time until work starts up in April again. It sure is nice having the Rockies in your back yard. As for my future plans, I do not plan on getting married or having kids because my life is great right now. I can do what I want, when I want and it feels great!!! Take care everyone and get out there and enjoy the wilderness! 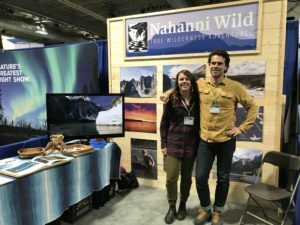 After another amazing summer spent on the Nahanni, I managed to make my way to the east coast to check out the Celtic Colors Festival as well as some backcountry hiking, camping, biking and live music! Plus I may have become a pro sportyaker on the Ottawa River, only 2 dumps! I am getting excited as the snow is starting to fly and ski season is quickly approaching. I will be working at Kicking Horse Resort again this season, so if you are in the area grab your skis and come play in the steep and deep! Happy travels this winter, and as always looking forward to more paddling adventures up north next season! Linda and I are 5 months into our retirement travels. 4 weeks on the Nahanni has been a tough act to follow, wow. But 3 months of paddling in New Brunswick and getting fat on lobster and blueberries comes close. From Costa Rica our travels continue to the Baja and New Zealand in January. Recently we made a huge decision: Uncommon Journeys (UJ) is closing down our winter trips at the beginning of October. It has been a fantastic business and lifestyle for the past 15 years, but new endeavors we are involved in are making it difficult to dedicate the time and resources required to run UJ effectively. Over the past few years, in addition to Uncommon Journeys, Rod has been developing Waste to Energy Canada (WTEC), a sustainable energy company based in British Columbia. The company has generated tremendous interest, and it has become a full time job. This decision has not been made lightly as dogsledding has been such an integral part of our lives. Uncommon Journeys has not only been our place of business, it is our home and as such, we have chosen not to sell. We will be staying on our property in the Ibex Valley just outside of Whitehorse. Because of this change, we are actively seeking new homes for several of our Alaskan Huskies (up to age 7) while our older ones will stay with us for retirement. We have both intact and altered males and females from great bloodlines and the majority of them have spent time up front leading our tourism teams. Our dogs are well socialized and would make ideal additions to any recreational dogsled team or family looking for a skijoring or hiking companion. In the past they have also proven that they adapt well to life as a pet. We have several dogs living all over North America and the UK with past guests and staff of Uncommon Journeys. We are happy to adopt the dogs to loving homes free of charge. If you are interested in learning more about these dogs, please feel free to contact us at info@uncommonyukon.com. A busy year has passed with a great deal of change for the Preto family. Rose Trudie Preto was born in March and she is the apple of her daddy’s eye! Good thing she got her Mom’s good looks and patience. Lisa is a natural at the whole parenthood thing and Andy is improving. We have sold our house in Whitehorse and bought another in Haines Junction. We are stoked to say that it tested out as the most energy efficient single family dwelling on record in the territory! What a difference from our old, leaky duplex…and the view is great! Andy has taken a position at St. Elias Community School teaching senior sciences, physical education, outdoor education and social studies. The first outing of the winter semester’s W.I.S.E 9/10 program will be a 5 day bison hunt. Wish us luck. Most of the students have been hunting longer than Andy so he should be in good hands. This past summer saw Andy heading up to the Firth for a great trip with fantastic guests. A highlight was having several hundred caribou sneak up on him during dinner time! Lisa and Andy are presently focusing on the new job, new baby, and all the projects associated with buying a new acreage. We just finished our quail and laying hen houses…quite a job to make it grizzly proof and winter worthy! I’m currently in my second year of studying psychology at Quest University in Squamish, BC. Hoping to get some canoe and swiftwater certifications in the next couple of years so that I can start doing more trips with NRA again! Had another great summer, guiding on the spectacular Nahanni River, then getting the pleasure to do a trip on the beautiful Tatshenshini River. My summer ended spending time in Whitehorse and adventuring around the territory, going to Haines Alaska, Dawson City, Tombstones and then heading out to an old family cabin on Tagish Lake. I spent the fall with my family out in Barrhead, Alberta. My winter plans are still to be determined, but will be focusing on creating some new river tunes on the guitar. Got my arctic fix with a recent ski traverse in Northern Baffin Island. Polar bears, sea ice, and a 5000 calorie per day weight loss program! Geoff has been working in the Energy and Environment field for the last few years, after growing tired of staring glacial retreat in the face and experiencing first-hand the many other environmental challenges faced in the wild places he had been guiding. Geoff is working on carbon-negative technologies with a small company called Carbon Engineering, finds time each year to lead outdoor learning and mentorship river trips for youth with US-based charity GOALS (Get Outside and Learn Something), and spends the rest of his spare time complaining about living in the big city! Geoff misses the days of campfire cooking and grizzly spotting, and hopes Neil will bring him back for a few more Tats one of these summers. After 25 years, Lana and Henry Madsen continue their outdoor paddling and guiding adventures. They operate HeLa Ventures (www.helaventures.com) in Rocky Mountain House during the Spring, Summer and Fall. During the snowy season, both Henry and Lana are heavily involved in the cross country ski community. Their “other lives” see Henry as a Principal with Edmonton Public Schools and Lana as a leader at the Strathcona Wilderness Center. They are enjoying all their outdoor passions with their two daughters, Kiera and Rhea, who show promise to be the next generation of outdoor leaders and guides. I was fortunate enough to get back on the Tatshenshini again this summer. After another great trip I came home to begin the adventure of parenthood. Only about a month after getting back my wife Karen and I had a little girl named Nalani. She was born on August 12th. The delivery was quite the experience, only lasting about an hour and a half. Our little girl wanted out and she didn’t care that her mom wouldn’t have time for an epidural. What an amazing experience! Our next adventure is our roadtrip back East to Massachusetts with our baby girl and two dogs. Karen is not crazy about this idea but I have reassured her that everything will be alright. I’ll let you know how it all turns out! This fall I am back to Augustana University College in Camrose, AB for my fourth and final year studying outdoor education, and trying to get in as much weekend paddling as possible. In January I will be heading to Cuba, as part of a global and development studies exchange to cap off my degree! I look forward to many adventures this winter, and cannot wait to be back out on the river next summer! See you there! After my first summer on the Mountain River, I moved to Victoria to start my Master of Child and Youth Care. I’m loving it, but I miss being outside all day everyday. I hope to return to the north next summer! I had an incredible summer with great company on the Nahanni this year. I am very lucky to have had the opportunity to be in the north with all of you. This fall I moved to Chicago to start my PhD in Philosophy at Northwestern University, and I’m really enjoying it so far. Since I’m now in the birthplace of contemporary American comedy I’ve started doing improv and it’s a blast. I am looking forward to going to Tanzania for a month this winter where, among other things, I plan to hike Kilimanjaro! Thanks to you all for a great summer and I hope to see you on the river again! My Summer holidays from my position as a High school counsellor in Comox BC started with a spectacular hiking filled 14 Day Nahanni trip. It was great to kick off from shore and be back in the flow of river life again. After 27 years on the oars the only thing that gets old are the memories, at least the ones I can remember. The remainder of the summer was action packed with a family camping trip to Hornby Island followed by a week long kayaking trip off the west coast of Vancouver island and a final week of water and sun on Sprout lake in Port Alberni. Life on the big island is good! Family life is fun and fulfilling as my wife karen and I are busy raising our two girls Stella age 6 and Sophie age 4. Our days are full from home schooling activities to dance and violin lessons, swimming and of course our wrestling , which is really a tickle fest on the living room floor. As the rainy season is now upon us I look forward to the snow on the hills and to the spring thaw that follows.